My Italian cooking doesn’t stretch much further than a pizza or pasta dish usually, so I thought it was time that I would change that and this is how I came up with this Italian chicken. 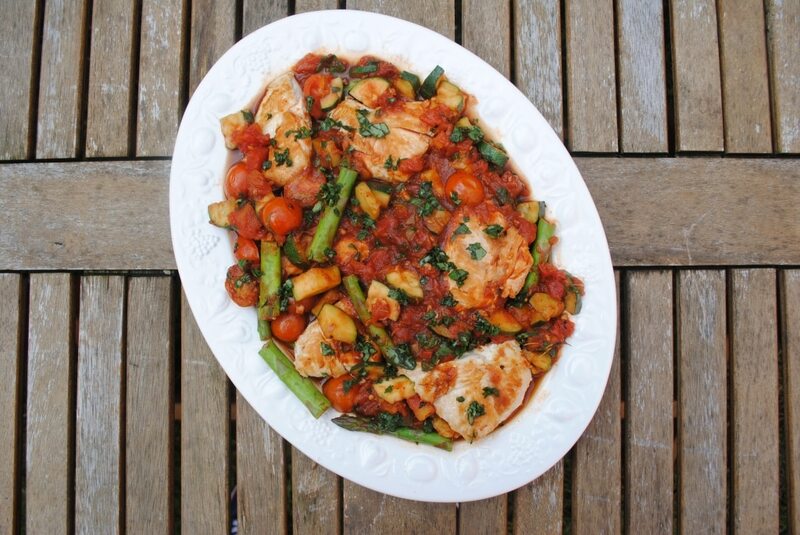 It is another pretty much throw in whatever you have on hand and add some Italian flavours. Chicken breast is a healthy source of protein if you eat meat, so I am going to be coming up with lots of new healthy ways to make it more interesting. As I know everyone gets bored with plain chicken breast after a while. Don’t feel like you have to follow recipes exactly. Cooking is about experimenting, changing things to suit your tastes and if you are on a budget, then using what you have leftover or what is on offer is a must. If a recipe calls for asparagus, but all you have is green beans, then make the swap. It is not going to change the meal a whole lot, but it saves you buying more vegetables and wasting the ones you already have. You can eat this dish on its own, or it is really good on top of spaghetti, brown rice or couscous. It also makes great leftovers and it freezes well too, so make extra portions and put in them in the freezer so you have healthy meals all ready for you. If you want to cook this in the slow cooker, then just add all the ingredients and cook on high for 3-4 hours or low for 6-8 hours. 1) Heat the oil in a large pan and then add the chicken. Cook for 7 minutes, turning every couple of minutes. Take the chicken out and put to one side. 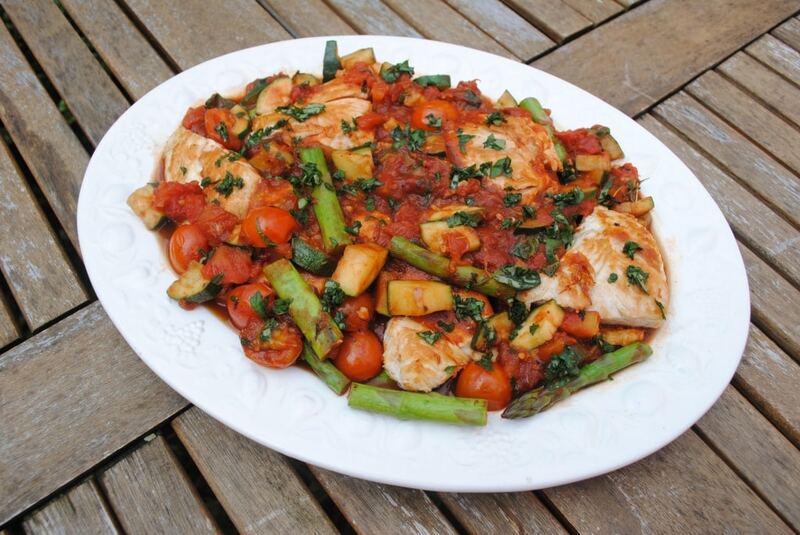 2) Add to the pan the shallots, courgette, asparagus and cherry tomatoes and cook for 3 minutes. 3) Put the chicken and vegetables into a oven dish with all the other ingredients and stir well. Cook in a preheated oven at 200C/390F for 30 minutes, making sure the chicken is cooked through. What Italian dish would you like a healthier version of? Leave a comment below and the recipe might appear on the blog soon. Want to make sure you never miss a Hungry Healthy Happy post? Make sure you have subscribed by clicking here. Thanks for another low calorie recipe. I always struggle to know what to eat on non-gym days where my calorie limit is lower. This looks amazing. I love Italian food, but I usually just think of pasta too. Great idea! Thanks for the slow cooker tip too. I shall be putting all of this in my slow cooker before I go to work tomorrow. I bet it will smell amazing by the time that I get home. yum, yum, yum, YUM! I love your recipes Dannii. I am so happy that I stumbled across one of your recipes on Pinterest and that I decided to click through to check out your website. I have tried so many of your recipes and I love them all. They are also a big hit with my family too. I like how they are not overly complicated and my kids can help too. They enjoy making things with me and it makes it easier for me to get them to try new things. Thanks again! I would really appreciate some suggestions for healthy ravioli fillings. I love anything with asparagus in it. It is my favourite vegetable. I love all the colours. Eat the rainbow! Oh wow! That looks so good. A great way to boost my vegetable intake. My husband is going to love this. Thanks for a great recipe. I would love a healthy carbonara recipe please!